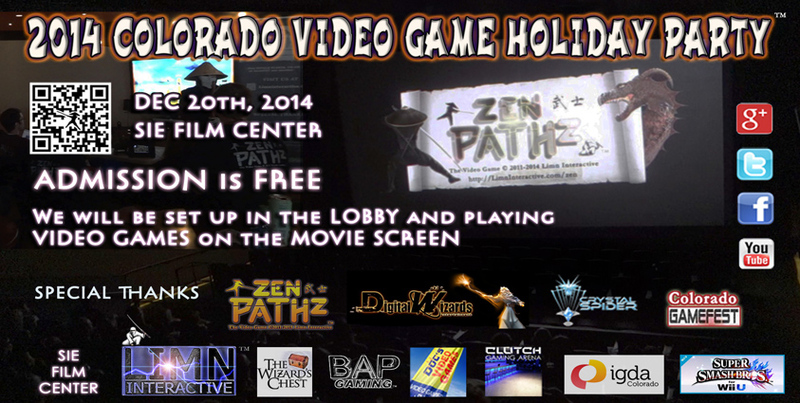 Join us for the 2014 COLORADO VIDEO GAME HOLIDAY PARTY on December 20th. We will set up in the lobby and also be playing video games on the MOVIE SCREEN. This event will be free to attend. They have a full bar inside with local craft beer, popcorn and more. Join the Colorado eSports scene for gaming on the BIG SCREEN. Enjoy casual play also. Meet with Colorado Springs, Denver, Boulder game developers, Colorado indie game developers, professional gamers, and others from all around the Mountain-States region interested in video games. Don’t miss the biggest Denver Super Smash Bros tournament, Zen Pathz tournament, Mario Kart and more video games on the largest screen you will play on in Colorado. Play unique Denver indie video games, Boulder indie video games, AAA, retro classics, etc. More details and RSVP HERE. Please note: games, attendees, activities, etc subject to change without notice.